Now on to planning last minute details for tonight's costume. I realized I need to get some black nail polish and some control-top stockings. Since I didn't manage to take any photos of our awesome decor on Halloween night, I snapped a few before cleaning up today. Of course it's not the same in daylight without the fog and flashing lights. 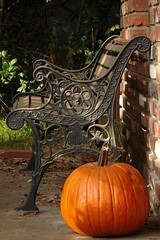 I still have my pumpkin, which I just adore, on my front porch. Pumpkins are not just for Halloween, but represent autumn in general to me. While I don't really participate in a traditional Thanksgiving anymore, one of my favorite things about the holiday is pumpkin pie. I guess that's why I was so confounded to go into a Coffee Bean last night (I got a gift card!) to finally try out one of those pumpkin spiced drinks only to find they are no longer on the menu. Their attitude seems to be: Halloween is over, it's now Christmas and we have peppermint. Now, I love me some peppermint, but I don't need it on November 2nd, when I'm in the mood for some pumpkin spice and nutmeg. I was very annoyed. I certainly is starting to look a bit more like Fall outside, but is quite warm today and is going to be up in the 80's all weekend, I hear. As long as it doesn't rain, I'll be perfectly content. I know. I went to CB&TL today and there was Christmas decor. I love it, but it's way to early. I need to eat turkey first. Yes, I love Halloween too. So bad it comes and goes so quickly. But we can look forward to Christmas being less than a month away!